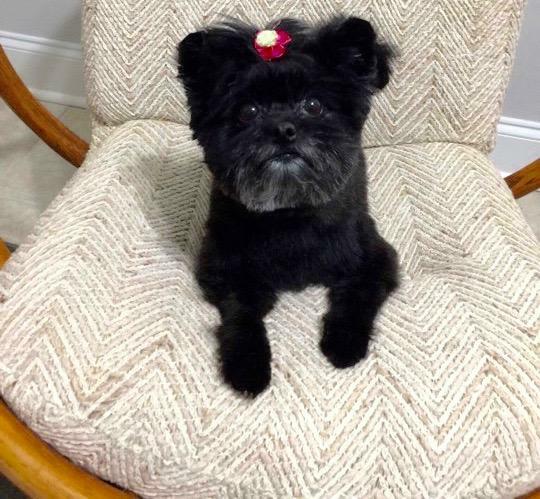 "Maddie came to releash with a broken femur and after 2 failed surgeries her leg was removed. 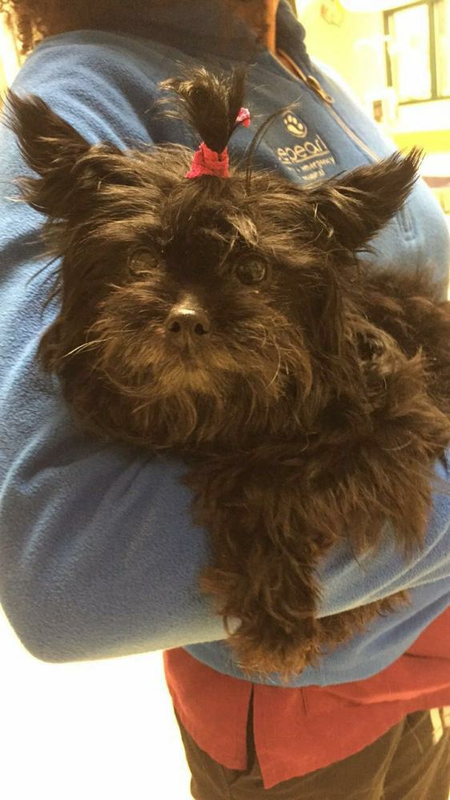 She's an adorable yorki mix, only 5 pounds. She's great with dogs! She's completely house broken, eats like a lab, and I don't even walk her on a leash. She listens well and she sleeps on the bed. Maddie does not like strange dogs in her space but once she's used to them she's great. She is good for the groomer and bath time. She's a great little dog, she's about 3-5 years old. She's a good car rider, if she's in your lap. Crate trained, and really I would keep her if I could!" EDIT: She is housebroken when you're home, she is crate trained for when you're not! Maddie had recheck radiographs to see the progress of her healing. She is bearing pressure on that leg and doing fairly well. The surgeon is pleased with her progress so far, and will recheck her radiographs again in a month in hopes that more callus has formed on the bone. In the meantime, she will continue to have water therapy and limited, supervised activity in her foster home. Maddie had her second surgery to correct her fracture on April 19th where they double plated her tiny little femur. Because her bone is a little smaller than a pencil, it needed extra support to help it heal. Maddie is currently recovering in her ROCKSTAR foster home, where she is under strict crate rest and supervised walks to help with the healing process. Her foster mom is doing water therapy and laser therapy to help her heal. She is one lucky girl. You may remember Maddie. 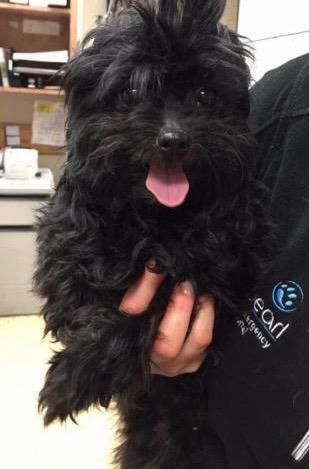 Maddie is a little 4lb yorkie/affenpinscher mix (we think) that was scheduled to have her leg amputated at a local shelter because that's the best they could do for her. We KNEW we didn't have the money for her 3K surgery, but this is her LEG and if it could be fixed, we wanted to try. We raised about $1,000 for her surgery and so we were in a pretty bad spot after that financially. BUT... we saved her leg and so we called it a success regardless. Now we find out the plate that was implanted failed and they needed to redo the surgery. We are already in a really tight spot financially, and now this. We don't know what to do. We had no choice but to have the rushed surgery to fix it since we knew how much pain she was in. However, that bill is lingering, and we are really worried. 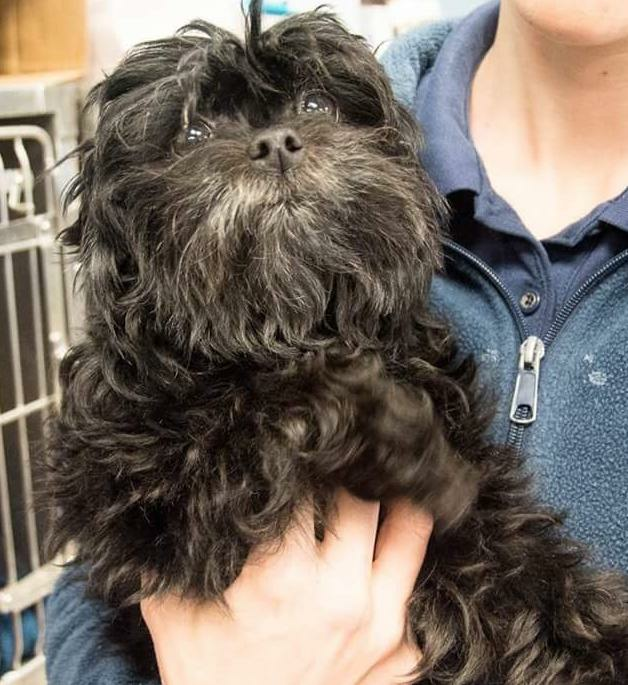 Maddie, our little Affenpinscher/Maltese mix who had a plate and pin placed in her left hind leg, is out of the specialty hospital and in her foster home to begin the first steps in her recovery! It will be about 8 weeks before this girl is available for adoption, but we will be sure to keep you updated on her progress! Thank you to everyone who sent her healing thoughts and donated to her care!! Great news! Our baby girl is a fighter and has made it out of surgery with her leg! The orthopedist worked his magic and was able to place the smallest plate they have to align her femur. He says he believes the injury is at least 3 weeks old, confirming our nightmare that she has been suffering for quite some time. Surgery took two hours and she will have weeks of recovery ahead of her, but we expect her to be back to a happy, bubbly girl sooner than that! WE HAVE 3 HOURS!! It wouldn't be a day in rescue if we didn't have an emergency!!! This is a one year old affenpinscher that we think was hit by a car. We want to save her and see if we can save her leg before just amputating (which is what is being recommended) but that means we NEED YOU!! We have an ortho specialist consultation on standby for if we can raise enough for her and we only have about 3 hours to do so!! Are you able to help us help her?! If so, please donate by using one of the following methods! 100% of what you donate is tax deductible!! We need to raise $2,000 in THREE hours!! PLEASE help!! UPDATE: Little miss Maddie (with the broken leg) has been sprung from the shelter and arrived at Blue Pearl Veterinary Specialists just moments ago! She is scheduled to undergo surgery tomorrow and is pictured with Kevin, the Veterinary Technician assisting in her care. It is pretty clear that her femur fracture is by no means new, which absolutely breaks our hearts! How long has this baby had to suffer without medical attention? We can't even imagine the agony she has endured. We are hopeful that it is not too late and her leg can be saved, but the surgeon won't know for sure until tomorrow. All we know is that she is in the best of hands, and no matter what her days of pain are long gone!